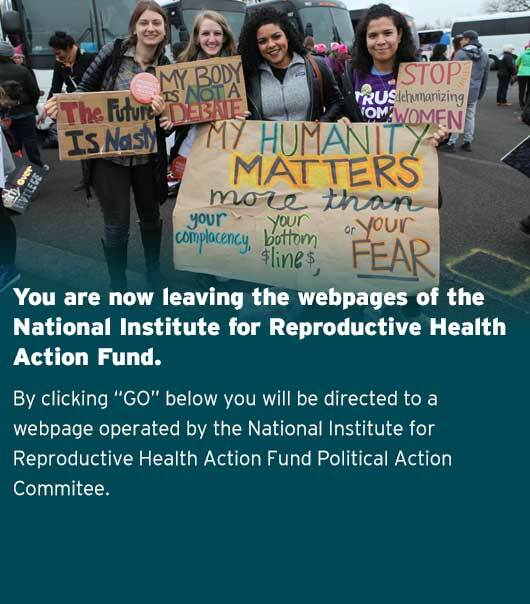 The National Institute for Reproductive Health Action Fund creates a statewide reproductive health and rights agenda in New York. This includes cutting-edge policy change, and partnering with elected officials to pass proactive, pro-choice legislation and defeat anti-choice initiatives on the state and local levels. The NIRH Action Fund sees our New York priorities as a model agenda that our sister organization, NIRH, adapts and implements in states around the country, according to our partners’ unique situations and needs. Learn more about NIRH’s partnerships work here. With reproductive rights under an unprecedented attack nationally, the Reproductive Health Act (S.2796) will secure and protect access to abortion in New York. Abortion is health care — not a crime. Our laws must allow women and their health care providers to make decisions free from criminal sanctions. The RHA clearly repeals outdated and unconstitutional criminal prohibitions on abortion, and moves the regulation of abortion out of the penal code and into the public health law where it belongs. When New York legalized abortion in 1970, it led the nation in protecting women’s rights and health. But without updating the law for over 40 years, New Yorkers’ rights are now in a precarious position. Because our current law does not explicitly allow for constitutionally protected care late in pregnancy when a women’s health is at risk or a fetus is not viable, critically ill pregnant patients are forced to leave the state in order to get the care they need. The RHA ensures that qualified health care providers, including Advanced Practice Clinicians (APCs) like nurse practitioners and physicians’ assistants can provide abortion services within their expertise and training. The 1970 abortion law only references doctors as providing abortion care because the practice of medicine was limited to doctors at the time. Almost 50 years later, the medical field has changed dramatically and we seek care from different types of modern medical professionals. The new federal administration intends to repeal the Affordable Care Act and end coverage for contraception without a copay. Access to contraceptive services is essential to women’s health and equality. The Comprehensive Contraception Coverage Act (S.3668) is a way for New York to enshrine the advances of the Affordable Care Act in New York state law, so our residents have access to affordable contraception regardless of what happens to the ACA. Under current law, all insurers must cover at least one contraceptive method from each of the 18 distinct categories recognized by the FDA. The CCCA will require health insurance policies to cover at no co-pay all FDA approved contraceptive drugs, devices and products. That means that All New Yorkers- regardless of their gender – will be able to access the contraceptive method best suited for their health. The average woman spends about three decades — more than three-quarters of their reproductive life — trying to avoid an unintended pregnancy. Research has shown that having a year’s supply of contraception on hand reduces a woman’s odds of an unintended pregnancy by 30%. In New York, insurance plans only allow woman one, or sometimes three, months of birth control, which means multiple trips to the pharmacy for refills, increasing the risk of unintended pregnancy. For some women, especially those in more rural areas, this is a dangerous burden that can interrupt consistent use of contraception. The CCCA will allow pharmacists to fill a non-patient-specific prescription for EC, similar to how flu shots and the shingles vaccine are provided. Currently, insurance companies will only cover EC if the consumer visits a healthcare provider, receives a prescription, and then fills it at a pharmacy. For women who cannot afford to pay out of pocket for EC, this wastes precious time and puts them at greater risk of unintended pregnancy. NIRH is proud to partner with the Ending the Epidemic Taskforce to promote greater access to sexuality education for students of all ages across New York. Ensuring access to medically accurate, age appropriate comprehensive sexuality education (CSE) in schools by using an evidence based curriculum and reducing sociodemographic disparities in its receipt is central to improving the health and well-being of children and young adults in the State of New York. CSE, guided by the national standards, includes core content and skills to help young people acquire what is often called social and emotional learning (SEL). These skills include: self-awareness (the ability to recognize one’s emotions and thoughts and their influence on behavior); self-management (the ability to regulate one’s emotions, thoughts, and behaviors); social awareness (the ability to take the perspective of and empathize with others); relationship skills (communication, cooperation, active listening, and conflict negotiation); and responsible decision-making. As early supporters of the efforts to raise the minimum wage in New York State, we are thrilled with the success of campaign last spring. However, we know that recent changes to the minimum wage law left out tipped workers, and thus would left out the approximately 272,000 tipped restaurant workers in New York – the majority of whom are women– and remain committed to having one fair wage (OWF) for all workers in the near future, including tipped workers. This is an equality issue. Nearly 70% of tipped restaurant workers are women, disproportionately women of color, and 40% of whom are mothers. The sub-minimum wage for tipped workers is in effect legislated pay inequity for a predominately female workforce, perpetuating the gender pay gap. The restaurant industry has been identified as the single largest source of sexual harassment claims in the U.S. The 43 states with lower wages for tipped workers have TWICE the rate of sexual harassment and THREE TIMES the rate of management coercion of workers to subject themselves to objectification than the 7 states with one fair wage. The poverty rate among tipped workers is lower by one fifth in states with OFW and the reduction is most significant for workers of color – a full 18% of tipped workers of color in states with a sub-minimum wage live in poverty, compared to 14.5% in states without a sub-minimum wage. As the United States’ largest school system, New York City public schools reach more than one million students. Current state law requires that students receive one semester of health education in both middle school and high school, and New York City requires that each of those semesters include sexuality education. However, even this insufficient mandate is not being uniformly met. The National Institute for Reproductive Health Action Fund (NIRHAF) calls upon the NYC Department of Education to mandate system-wide inclusive, age-appropriate, K-12 sexuality education that meets the National Sexuality Education Standards. NIRHAF also serves as the co-chair of the Sexuality Education Alliance of New York City, a broad coalition that advocates for comprehensive, K-12 sexuality education for all New York City youth. Reproductive health clinics offer a full range of reproductive health services, including abortion, and are often a lifeline for women and all people living in underserved neighborhoods. In 2009, after years of advocacy by NIRHAF and our sister organizations, the New York City Council passed legislation that heightens penalties against those who follow and harass people seeking care at reproductive health clinics. Despite this law, aggressive and disturbing protester activity continues to be an ongoing challenge for many stand-alone clinics in New York City. NIRHAF works closely with advocates, providers, law enforcement, and local government to ensure both clear access to health clinics and the safety of patients, clinic escorts, providers, and staff. Crisis pregnancy centers (CPCs), legally known as “pregnancy service centers”, are unlicensed facilities that adopt the guise of a medical facility, offering pregnancy tests and sonograms while lying about the medical realities of abortion and contraception in order to manipulate women into continuing unwanted pregnancies. After NIRHAF published a report on New York CPCs, the New York City Council passed a law in 2011 that requires these centers to maintain confidentiality and to disclose (through signage on premises, disclaimers on print and online ads, and in person and over the phone) that they do not have a licensed medical provider on site to provide or supervise all services. NIRHAF continues to work with the Department of Consumer Affairs, patients, providers, and advocates to ensure that the 2011 law is appropriately enforced and that CPCs in New York City are upfront about the services provided. The National Institute for Reproductive Health Action Fund is a proud member of the Sexual and Reproductive Justice Community Engagement Group (CEG), a group of community leaders, activists and nonprofit organizations that work with the support of the NYC Health Department to promote sexual and reproductive justice in New York City.